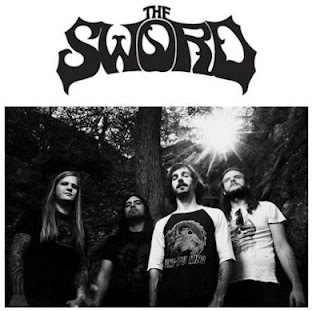 Austin, Texas metal luminaries THE SWORD will enter Magpie Cage Studios at the end of the month to begin recording their fourth album, "Apocryphon", for an early fall release via their new label partners Razor & Tie. The CD will be produced and engineered by J. Robbins (CLUTCH, JAWBOX) and will feature cover art by famed comic book artist J.H. Williams III (Batwoman, Promethea). THE SWORD will commence a worldwide tour in support of "Apocryphon" in October. In advance of last month's premiere of this year's movie "Marvel's The Avengers", THE SWORD released "Hammer Of Heaven", an early track dating back to 2003 that was not included on "Age Of Winters", which the band submitted for inclusion on "Avengers Assemble", a 14-track compilation of music from and inspired by the film. Due to severe space limitations, the song did not make the final track listing, but the band, along with their new label partners at Razor & Tie decided to make "Hammer Of Heaven" available digitally to coincide with the release of the film. Click here to download the song on iTunes. THE SWORD's third album, "Warp Riders", sold around 8,900 copies in the United States in its first week of release to debut at position No. 47 on The Billboard 200 chart. "Warp Riders" marked the first release where the group has worked with an outside producer. Helmed by Matt Bayles (PEARL JAM, MASTODON, ISIS), the album was anchored by an epic science-fiction narrative. The storyline was a psychedelic space opera that explored temporal themes of death and rebirth. "Warp Riders" also found THE SWORD expanding its range from pure metal to include bone-crunching hard rock at large.